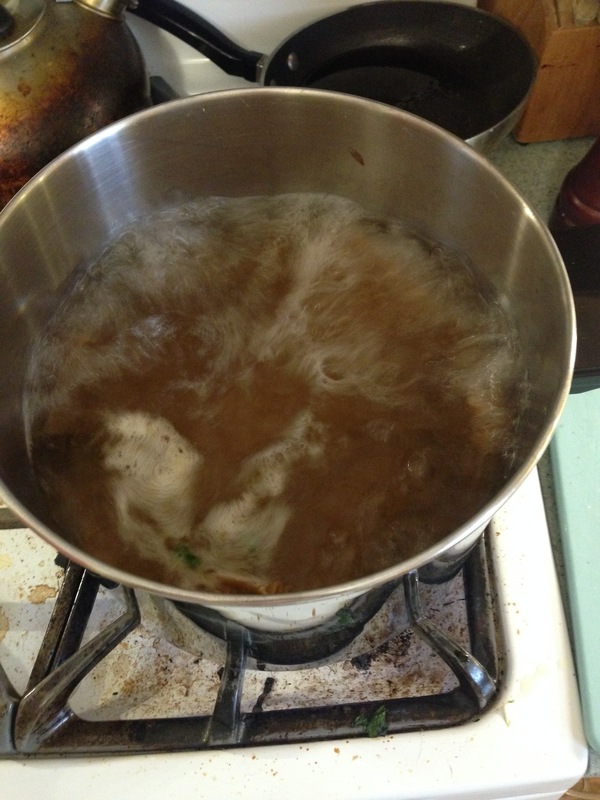 Begin by boiling 4-6qts of water. I salt and oil mine (flavor and helps with the noodles not sticking). While water is heating up to a boil begin cutting your veggies. 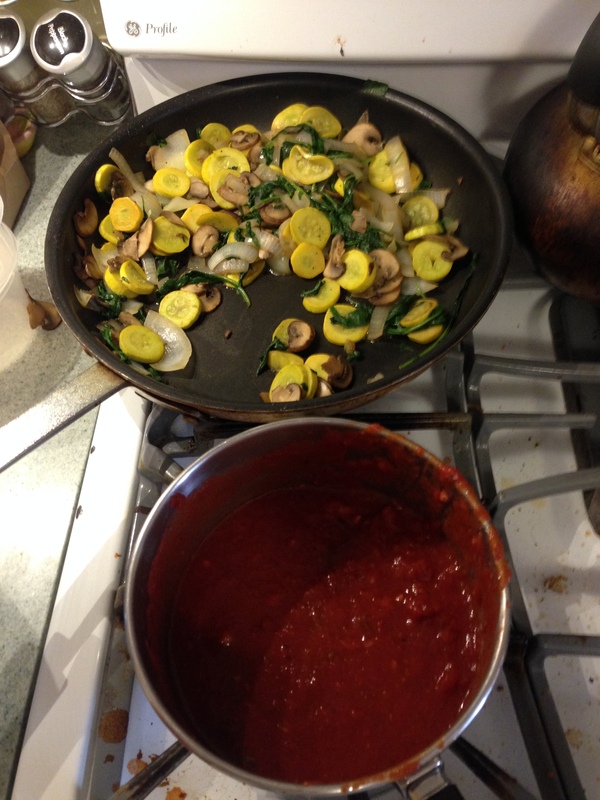 I julienne the onions, cut the squash in little disks, and use a mandolin for the mushrooms. I don’t do anything to the baby spinach. Once all veggies are cut I sauté the veggies with olive oil, salt and pepper(I sometimes add garlic and basil). I sauté the harder of the veggies first, that way by the end all are soft. Mushrooms, to get water out, then squash, then add onions. At the very end I add the spinach to the pan. The water should be boiling now. 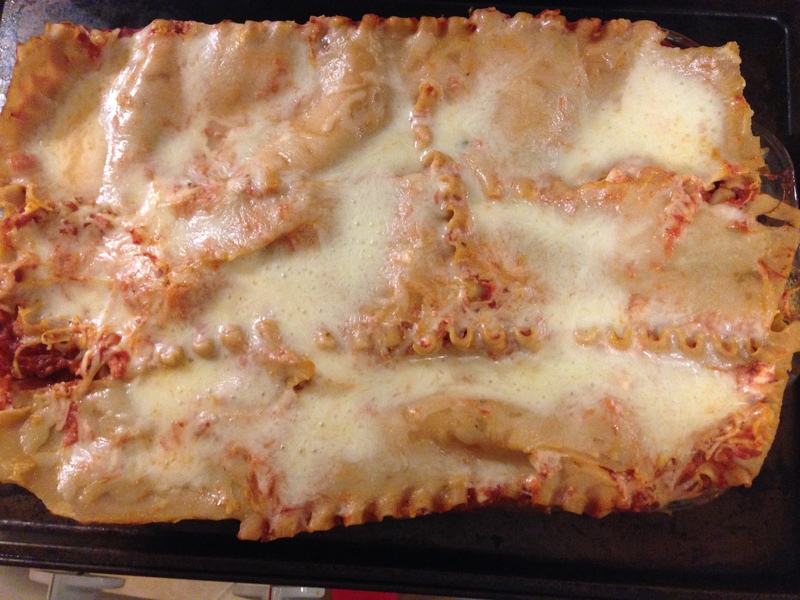 I add the lasagna noodles and follow the instructions on the noodles package. Usually about 9-10 minutes. Once the noodles are done, I strain and rinse with cold water (so I can manipulate noodles to pan-otherwise they are too hot (I think that it also helps then not stick together). Pre-heat oven to 350. Then I grab my pan and begin the process of layering. 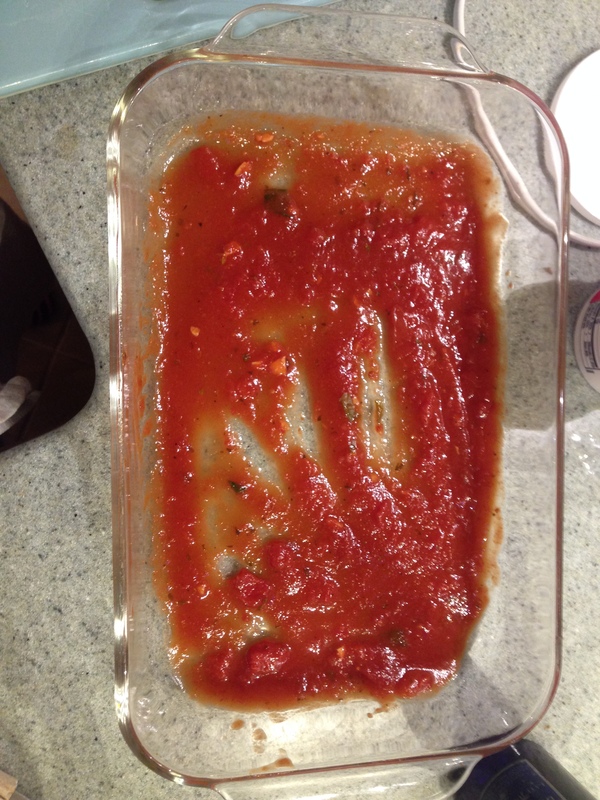 First I place a thin layer of sauce on the bottom of the pan. Then lay out the noodles, a little more sauce, veggies, ricotta, mozzarella, sauce, noodles. I repeat this until I run out of ingredients or room in my pan. Making sure to always put mozzarella on the top, that way it melts nicely and then browns a bit. Once that’s all done, I place in the oven with foil so the mozzarella on top doesn’t burn. I bake it for 30 minutes. I usually do this a few hours before my husband gets home from work. Then when he gets home and it’s time for dinner, we just have to heat it up. During the last 10 minutes of heating up I remove foil to brown the cheese. Yet again! It came out fantastic! I hope if you decide to make, it turns out just perfect for you too! Today, I feel accomplished…the house is still messy, but for me I got what I wanted done! That makes me happy! For the last two days I have been washing and sorting all of my children’s clothes that they have outgrown. Boy oh boy! It was a lot! When sorting thru the clothes you go through a ton of emotions…The first feeling I felt was overwhelmed, because I had to wash everything. Then I felt happiness, to know that my son and daughter were loved, because a lot of the clothes were gifts. Next emotion was sad, but a happy sad. I know strange right?! Well let me explain. I started with my son’s clothes. I found his very first outfit. This made me sad that he was in the NICU for a week, and then sad that he couldn’t wear it anymore because it’s so darn cute. 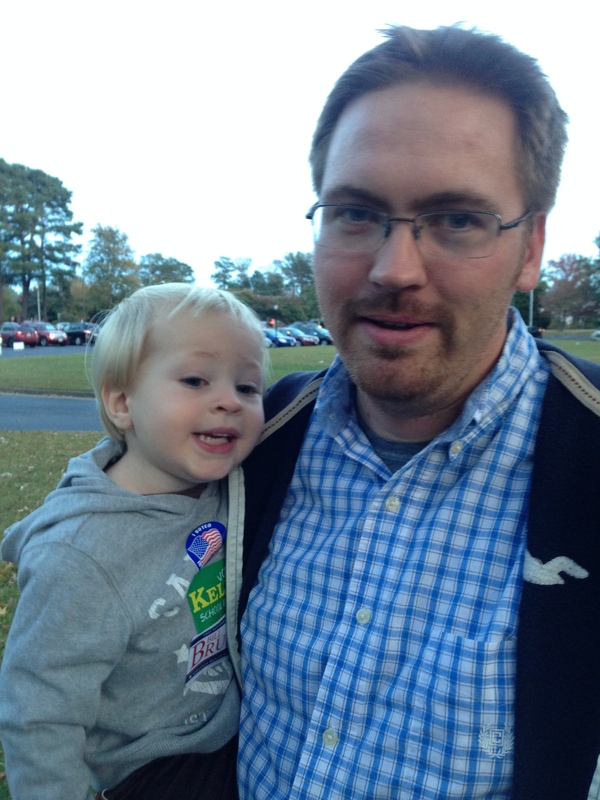 Then I saw his first Christmas outfit…etc. The clothes all brought back happy memories, it just made me sad to realize that time are flying. Then I felt, shocked. I can’t believe that my daughter who is almost 8 months old already has a bag full of clothes that don’t fit. She is growing so fast! She’s rocking 12-18m clothes… I sorted the clothes by size and then began putting them into bags, until I can get those plastic bins. While sorting I decided to take some of the clothes and sell/donate them. A little extra cash to help buy more clothes for my ever-growing children! I am not getting rid of anything yet…Then I felt happiness and accomplishment! The kiddies had settled down for their afternoon nap! Yes, together at the same time… it was FANTASTIC! I was able to eat lunch and make my Veggie Lasagna! 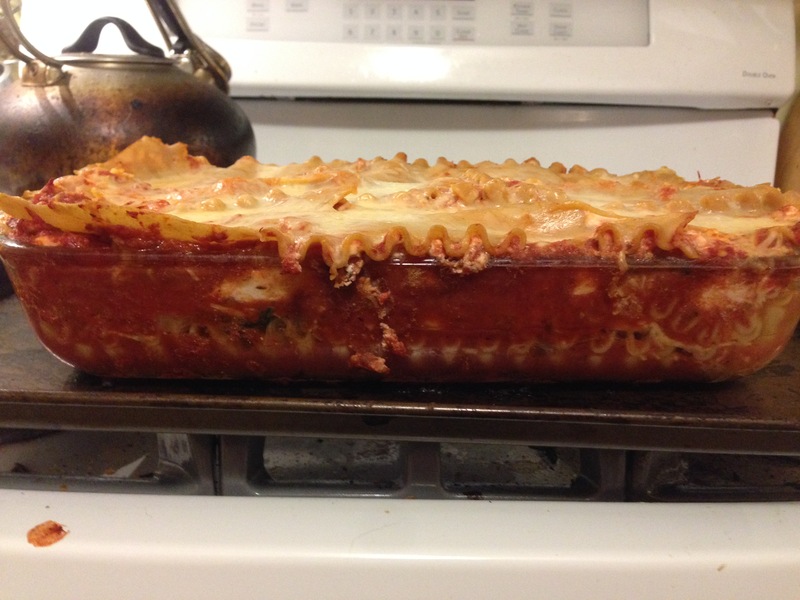 I love my veggie lasagna…I think I’m a little bias…but it’s really freakin’ good! I’ll put my recipe at the end of post. Then the children woke up from their naps and it was snack time…my son is a bottomless pit and my daughter just wanted to nurse! That’s easy. 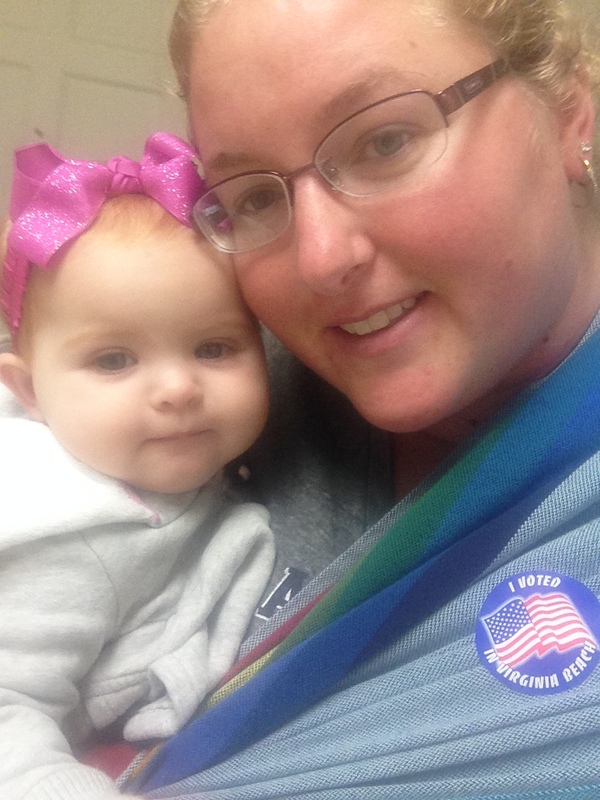 Today was election day…so once my hubby came home from work, we rode our bikes and voted! Came home and had a nice family dinner! Now it’s bath time and putting the babies to bed…Maybe, just maybe mommy and daddy can watch a movie!